The Works, Fife, offers great value artist materials, books, crafts, gifts, toys and games. With up to 80% discounts the Works in the Kingdom Shopping Centre offers a wide selection. 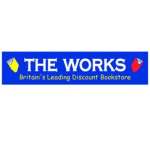 Visit www.TheWorks.co.uk for a huge selection of products which you can shop from the comfort of your home and select Click & Collect to have your shopping delivered to your local store.